GUEST BLOG/ By Bill Center, longtime sportswriter for U-T San Diego, is an employee of the Padres.--Years ago, I had the privilege of touring the Hall of Champions in Balboa Park with Bob Breitbard as my personal host and tour guide. Bob was one of those rare people whose face naturally formed a smile. At every stop -- and there were many -- he'd share a personal story about the display in front of us, and then he'd pause and smile. We then climbed the stairs to the second floor of the building. When we reached the landing, Bob looked across the building and offered one word: "Legacy." "Do you know what the overriding common thread is?" Mr. Breitbard asked me. "Closer to the heart than that," responded Bob. "San Diego." There was another pause, and then Bob made his pitch. "Every one of the men and women honored here represented San Diego," Breitbard said. "Some won at Wimbledon. Some were Olympic gold medalists, others World Champions. Some played on our greatest teams, others on teams around the country. But all of them represented us as San Diegans." As he spoke, Breitbard's eyes scanned the plaques adorning the walls of the Balboa Park shrine he created. I was reminded of that long-ago visit with Breitbard as I recently listened to Padres executive chairman Ron Fowler as he spoke in front of the same plaques that Breitbard created decades earlier. 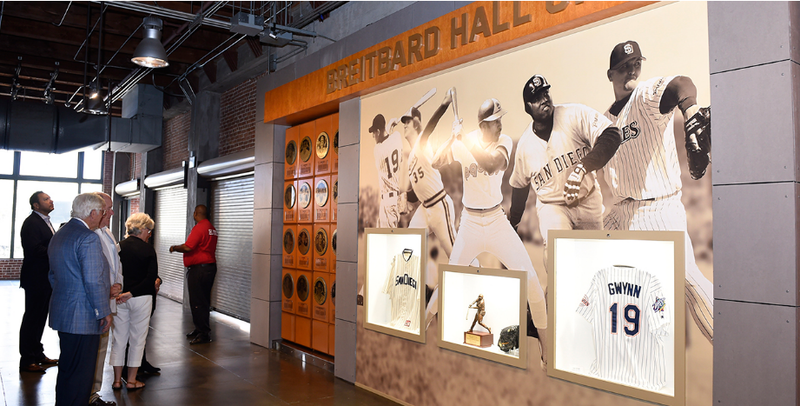 The Breitbard Hall of Fame -- and San Diego's sports history -- has a new home in the Western Metal Supply Co. Building at Petco Park. And I believe this fourth home of the Hall of Fame will be its best, because it will be enjoyed by far more people than in its previous home. Legacies are most meaningful if they are shared. Fowler, businessman/restaurateur Dan Shea and the Padres have done this right. Not only is the new Hall of Fame spectacular in design and appearance, but it will also be accessible to millions of San Diegans each year during Padres games and other Petco Park events as well as in tours of the downtown ballpark. "We could not be more pleased," Breitbard's daughter Gayle Klusky said on behalf of Bob's family during the unveiling on Friday. "Dad's legacy is preserved here." Preserved and expanded with an eye toward the future. San Diego's sports history can be traced in the 153 mounted plaques -- 156 once newly announced honorees Garry Templeton of the Padres, former San Diego State football coach Claude Gilbert and Olympic gold medalist sailor Robbie Haines are formally inducted -- mounted on the walls. Oh, and there is one additional plaque. It is of Bob Breitbard, whose vision and love of San Diego created the Hall of Fame. Yes, Bob Breitbard created San Diego's Hall of Fame. And Ron Fowler and the Padres have carried it on as caretakers of Breitbard's dream.